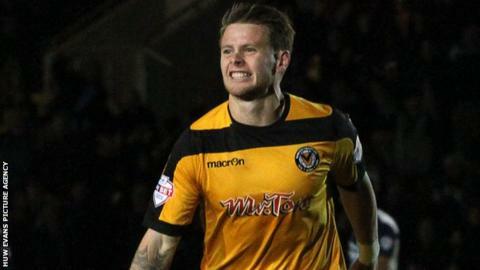 Newport County moved into the League Two automatic promotion places thanks to Mark Byrne's second-half winner against Portsmouth. Strikers Shaun Jeffers and Aaron O'Connor went closest for the Exiles in the first half, while midfielder Jed Wallace threatened for the visitors. Both sides pushed for a winner after the break but Byrne settled it with a low shot from outside the box. A fourth successive win means County move up to third, with Pompey in 17th. "We're delighted [to be third]. We'll certainly enjoy being there but we know the hard work has only just begun to try and stay there. "Our standards that we set in terms of performances, work rate and attitude have got us there and that's what has got to continue. "[We have] taken six points off Portsmouth, the biggest club in the league. "It's a massive achievement for our players to do the double over Portsmouth." "We deserved something today and I have just looked at the stats - 17 shots compared to their eight. I have just said to the players you don't always get what you deserve and today we didn't. "I was pleased with the whole performance - the game plan was what it was. We need to take a chance to score and that's the only criticism I have today but I am certainly not going to criticise the players, I thought they were excellent. "We have to keep believing, I still believe massively and I look in that dressing room and I can't criticise the players for the shift they have put in. "We have asked enough questions of them and put in a decent performance to take something from the game - anybody who tells me differently I would like to talk to them." Match ends, Newport County 1, Portsmouth 0. Second Half ends, Newport County 1, Portsmouth 0. Corner, Portsmouth. Conceded by Mark Byrne. Corner, Portsmouth. Conceded by Joe Day. Attempt saved. Craig Westcarr (Portsmouth) right footed shot from outside the box is saved in the bottom right corner. Foul by Yan Klukowski (Newport County). Nicky Shorey (Portsmouth) wins a free kick in the defensive half. Substitution, Portsmouth. James Dunne replaces Danny Hollands. Substitution, Newport County. Max Porter replaces Adam Chapman. Attempt saved. Nicky Shorey (Portsmouth) left footed shot from outside the box is saved in the centre of the goal. Substitution, Newport County. Rene Howe replaces Aaron O'Connor. Attempt missed. Nicky Shorey (Portsmouth) left footed shot from outside the box is close, but misses to the right from a direct free kick. Foul by Adam Chapman (Newport County). Yan Klukowski (Newport County) is shown the yellow card. Attempt saved. Adam Webster (Portsmouth) right footed shot from outside the box is saved in the bottom left corner. Substitution, Portsmouth. Craig Westcarr replaces Ryan Taylor. Shaun Jeffers (Newport County) wins a free kick in the defensive half. Substitution, Portsmouth. Andy Barcham replaces Johannes Ertl. Substitution, Newport County. Yan Klukowski replaces Lee Minshull. Paul Jones (Portsmouth) is shown the yellow card. Goal! Newport County 1, Portsmouth 0. Mark Byrne (Newport County) right footed shot from outside the box to the bottom right corner. Assisted by Andy Sandell. Attempt missed. Lee Minshull (Newport County) right footed shot from outside the box is high and wide to the right. Corner, Portsmouth. Conceded by Regan Poole. Danny Hollands (Portsmouth) is shown the yellow card. Attempt blocked. Jed Wallace (Portsmouth) right footed shot from outside the box is blocked. Attempt missed. Aaron O'Connor (Newport County) header from the centre of the box is just a bit too high. Aaron O'Connor (Newport County) wins a free kick on the right wing. Corner, Portsmouth. Conceded by Darren Jones. Foul by Matt Tubbs (Portsmouth). Attempt missed. Jed Wallace (Portsmouth) right footed shot from outside the box is close, but misses to the right. Corner, Newport County. Conceded by Paul Robinson. Corner, Newport County. Conceded by Nigel Atangana. Corner, Newport County. Conceded by Paul Jones. Attempt saved. Andy Sandell (Newport County) right footed shot from the left side of the box is saved in the bottom left corner.